The Pebble e-paper watch first hit the scene last April when it exceeded $1 million in funding in under 48 hours, and eventually ended up with $10.2 million dollars pledged and almost 69,000 backers, making Kickstarter history. I funded the project back on April 12th and finally received my black Pebble more than 10 months later, after numerous delays. During that time, more than 85,000 Pebbles have been ordered. Although some were critical of Pebble’s handling of their project timeline, I had no problem waiting for the watch to hit final production and ship. Vancouver-born Eric Migicovsky and his Pebble team correctly stayed the course and only shipped their watches when they felt it was ready. The final product reflects this. My watch shipped out of Singapore and reached the Western Canada in 11 days via registered air mail. 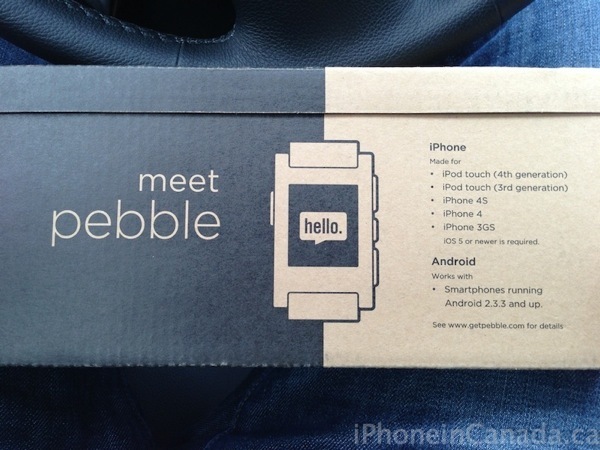 The box housing the Pebble is also its packaging, which leaves a low carbon footprint reminiscent of unboxing an Amazon Kindle. Inside there isn’t much to see other than the watch itself, Pebble’s proprietary magnetic USB charging cable and instructions to visit getpebble.com. The Pebble ships with a piece of plastic film to protect the watch’s scratch-resistant screen and the standard 22mm rubber watch bands. 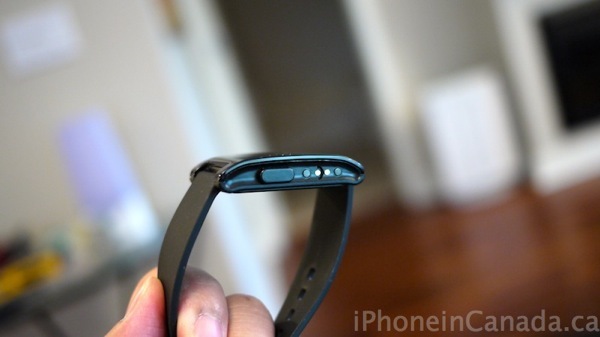 The latter is smooth and feels nice in the hand, which means it will be also feel comfortable strapped onto your wrist. The paper screen was smaller than I thought it would be, but it is crisp and clear. The plastic cover is very scratch resistant, as numerous times what appeared to be permanent scratches were easily buffed out. Pairing the Pebble with your iPhone is pretty easy, if you’ve connected a Bluetooth device to your phone before. 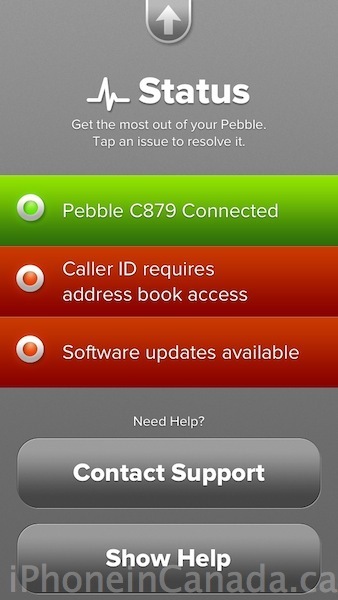 Once connected, the Pebble iOS app will instruct you to take a further step to enable notifications and access to your address book for caller ID, but most likely you will be like me and greeted with instructions to update the Pebble’s firmware, which was straightforward. So once you have everything setup, when you receive a text message the Pebble will vibrate, light up and show your message. It’s a pretty neat feeling checking out messages with a quick glance at your wrist instead of reaching for your phone. 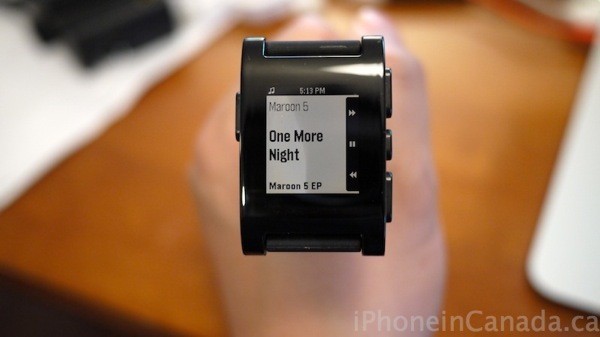 The Pebble’s backlight will turn on with a quick flick of the wrist thanks to its accelerometer. The vibration on the watch is strong enough that you won’t be able to miss a notification. Incoming calls show caller ID with options to answer calls or send them to voicemail. Notifications for messages and email look great on the phone, however I have had ongoing issues with getting Mail alerts pushed to the phone. You can scroll up and down with the buttons to show more text for longer messages or email alerts. 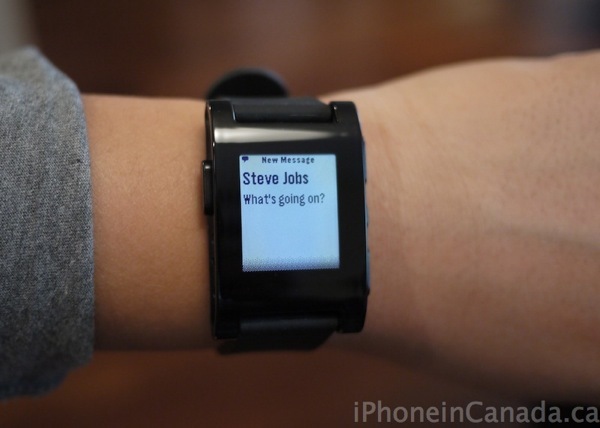 I’d like to see some sort of update to allow access to older messages, as Pebble will only display the current message received. So if someone sends you a tonne of messages you might miss the previous ones if you’re not looking. 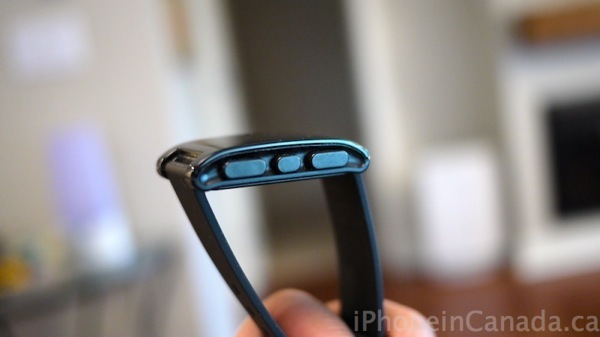 One of the best features is controlling the iPod app from your wrist. This is handy if you have your iPhone docked into a speaker. You can see the song, artist and album title, play/pause music and skip tracks. Being able to control the iPod from the Pebble is also a fantastic way to find your lost iPhone. Just start any song and you’ll be able to find your phone right away. Since Pebble is first and foremost a watch, let’s talk about the watch faces. Currently they are quite limited but the team announced their watch face SDK is set to arrive in early April, opening the doors for what’s really possible. The screen jumps back to a watch face after a certain period of time, but I found this was inconsistent at times, especially when I was using iPod controls. Current watch faces are found within the Pebble iOS app. You select a face and it gets sent to the watch. As for alarms, you can set multiple alarms right from the watch. 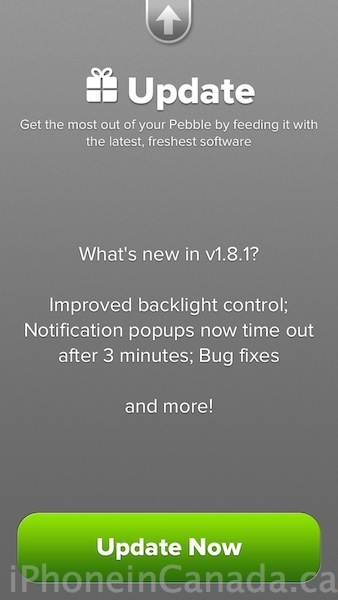 Other settings allow for changing the font size of notifications and controlling the backlight. In terms of real life usage, the Pebble is awesome when you’re busy and can’t physically reach into your pocket to check notifications. When you’re driving it’s much safer to glance at the Pebble versus fumbling with your iPhone. The same goes for when you’re washing dishes or working in an environment where it would be a pain to reach for the phone. For those with on call jobs, the Pebble is the answer to never have another missed call for work. As for battery life, Pebble advertises itself for a range of 5-7 days depending on how many notifications you receive. I was able to get about 5 days on average. There is a low battery indicator that shows up only when there is approximately 20 hours remaining. Other than that, you won’t know how much battery is left until that indicator appears, which is slightly annoying at times. The reason for this is because the voltage discharge curve is flat for the small battery. Charging the Pebble is easy and relatively fast as it takes only 2-3 hours for a full charge. The proprietary magnetic connector snaps onto the Pebble’s side easily every single time. 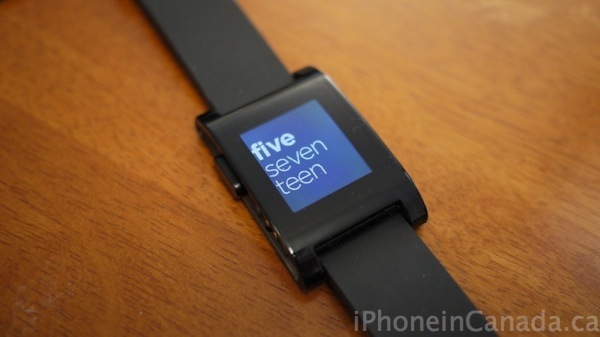 iFixit’s teardown of the Pebble estimates the small battery will last 6-10 years. Once that time is over, you’ll need a new watch since the watches are hard to open and repair due to large amounts of glue to ensure the waterproof seal. Pebble did say they plan to implement a recycling program for dead watches. As for battery drain on my iPhone, I did notice it depleting faster than normal by having Pebble connected all the time, on average taking away an extra 5-10% if the watch wasn’t connected, which the company clearly states. Then again, I am jailbroken on iOS 6.1 so your mileage may vary. After using the Pebble for almost a month, I can say it’s a comfortable watch to wear and it does the job for showing notifications, answering calls and controlling music. The watch does exactly as advertised and those who have seen the Pebble are impressed with being able to receive notifications to the watch. I have been called Inspector Gadget or James Bond (I prefer the latter; the person who called me Inspector Gadget is no longer alive) with this thing on my wrist as it’s pretty neat and fun to own. Pebble isn’t perfect though. I’ve struggled to setup push notifications for Mail numerous times (it was working initially but now it’s not). A current bug constantly pops up on my iPhone asking whether to “allow” Pebble to connect with my device. Battery life remains “short” and constantly remembering to charge the watch can be a pain. Button presses are quite stiff at first but over time they have loosened up. Some might find the vibration motor to be too loud at times (think of the iPhone 4 buzzing compared to the iPhone 4S). At the end of the day the Pebble leaves me wanting more. 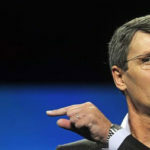 I want to see the watch app store (where’s Runkeeper? Freecaddie? 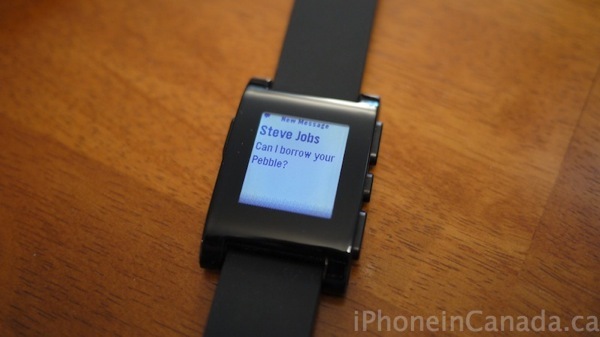 ), watch faces and other uses for the Pebble today, not tomorrow. However, all things considered (like 85,000 watches ordered and over $10 million dollars raised on Kickstarter), the guys at Pebble have done a phenomenal job with the watch even with its delays. It is satisfying to know I am supporting a worthy project where the sky is the limit on what the Pebble can do once developers jump on the upcoming SDK. 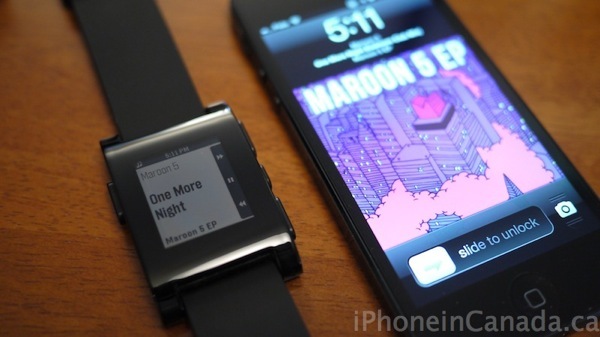 The Pebble will work with the iPhone 3GS/4/4S/5 and all iPod touch models on iOS 5/iOS6. 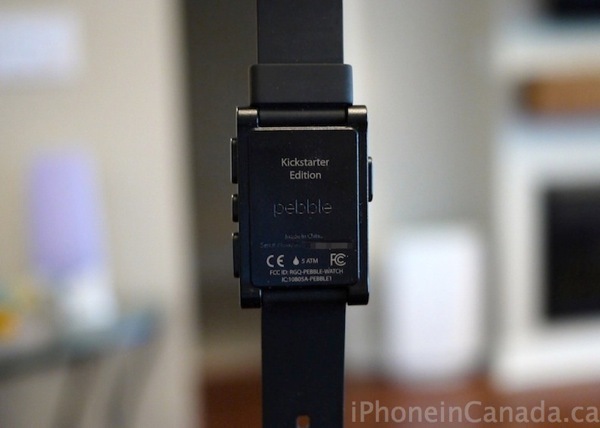 The Pebble Kickstarter Edition cost us $125+shipping. 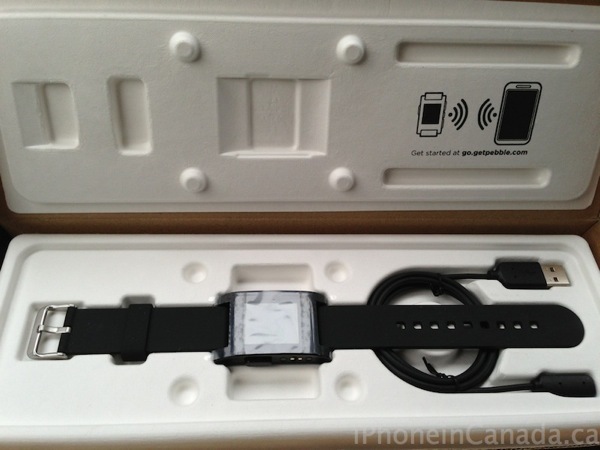 Current Pebbles can be ordered for $150 and all watches come with a limited one year warranty. 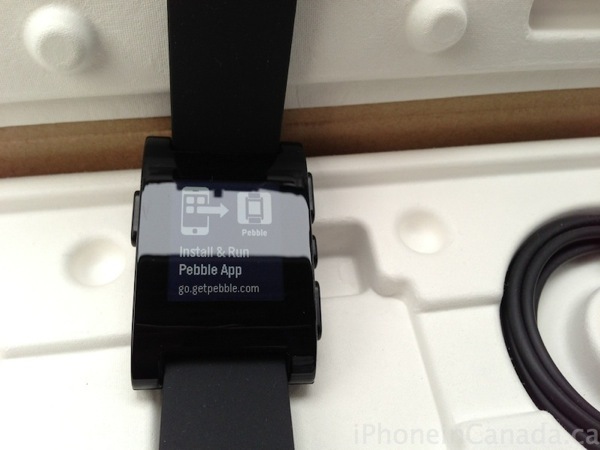 Have you received your Pebble yet?